The sprawling Brooklyn neighborhood is known as Bedford-Stuyvesant, or Bed-Stuy is comprised of two historically different areas, Bedford, and the historically more upscale Stuyvesant. Parts of the neighborhood are landmarked so the remarkable late-19th-century feel of this area will be preserved. 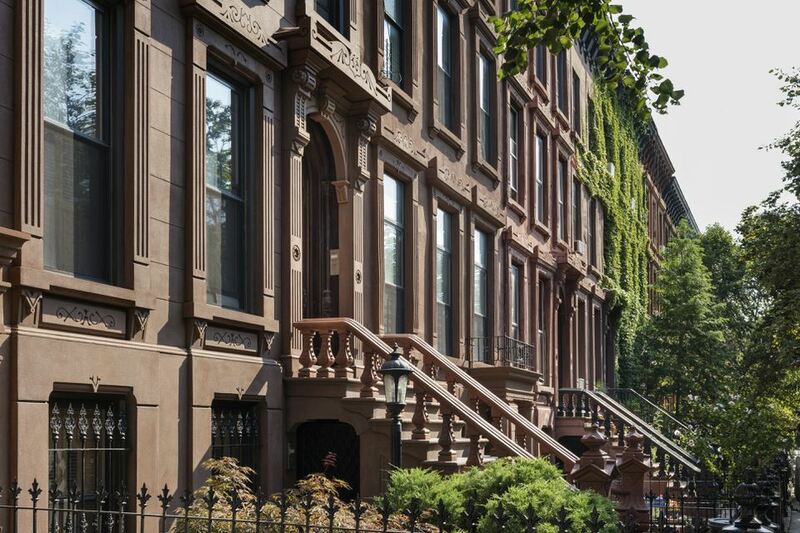 That means you can expect to see rows of gracious brownstone homes on tree-lined streets, lots of open sky (the buildings aren't more than four or five stories high), and historic buildings including churches and a small, old-fashioned community library. In the past decade, the area has become a haven for artists and young families. Long a bastion of New York City’s African American community, Bed-Stuy, like Harlem, has had a mixed population of homeowners and renters. Bedford Stuyvesant (along with other neighborhoods such as Fort Greene) has been an important political and cultural hub of black life in New York City. In fits and starts, the neighborhood has been gentrifying since the late 1990s. Many would-be home buyers from other parts of Brooklyn and New York City, priced out of other brownstone Brooklyn neighborhoods, have found incredible values in turn-of-the-20th-century brownstones in Bedford-Stuyvesant. Some have amazing detail; many are in need of substantial renovation. Much of the area is already landmarked. An even broader swath of buildings now under consideration for future landmarking. Transportation: Depending on which part of the neighborhood you live in, the area is served by the super fast A and C trains. The G is available too. On the east side of the neighborhood, you'll be closer to the J and M trains, a half hour ride to lower Manhattan. Buses are plentiful. Churches: Bed-Stuy has wonderful churches including the historic Bridge Street AME Church, and on a Sunday there’s a lovely church community feeling in the neighborhood that you won’t easily find elsewhere in New York City. For many residents, churches are one of the important elements in community life in the neighborhood. Restoration Plaza: The large Restoration Plaza complex on Fulton Street between Brooklyn and NY Avenues may look like any other mid-20th-century office complex. But it's historic. It was built with the blessing of then-senator Robert Kennedy Jr. in the civil rights heyday of the late 1960s as part of a federal response to riots in the area, which in turn were a response to racism and lack of jobs and adequate neighborhood services. In some ways the political heart of Bed-Stuy, today it is home to banks, a supermarket, administrative offices, an art gallery and the well-regarded Billie Holiday Theater, a community theater. Brooklyn Parks: Fulton Park, called “one of Brooklyn’s little-known oases," by former NYC Parks & Recreation Commissioner Adrian Benepe. "It is a true haven for the Bedford-Stuyvesant community, an outlet where people can come to sit, read, lunch, and enjoy neighborhood festivals,” he said. It’s home to an annual art fair in the summer, Halloween parade in October, and other family fun. Herbert Von King Park (Tompkins Ave., between Greene and Lafayette Aves.) was designed by the world-famous team of Frederick Law Olmsted (this famous design duo created Central Park and Prospect Park, as well). The community center also has a recording studio, fitness equipment, and an indoor dance studio, and the Eubie Blake Auditorium. (The jazz legend was a local resident.) You can attend free jazz concerts here in the summer. For environmentalists, the Magnolia Tree Earth Center is a must-see. Brooklyn’s biggest park, Prospect Park is 20 minutes by car, 20 by bike, a half-hour distance by public transit. Hotels: The Akwaaba Mansion was the first mansion to be transformed into a bed and breakfast. It's a huge, rambling free-standing home with a large yard and a Southern feel. Also, check out the more recently renovated 1887 Moran Victorian Mansion at 247 Hancock St. (between Marcy and Tompkins Avenues), and Sankofa Aban Bed and Breakfast. Another popular B and B is Arlington Place housed in a landmark brownstone, which was in Spike Lee's film "Crooklyn." Book a night at one of these hotels, and you'll have a luxurious weekend in Bed Stuy. Or stay at the hip boutique Red Lion Hotel. Located on Broadway, the hotel is filled with locally inspired art and is also pet-friendly. This hotel chain is known for hosting art series including readings, performances, and art shows. Red Lion Hotel and Suites offers multiple packages with local business including a beer-themed weekend and many others. Bed Stuy is a diner's delight. You can easily fill an entire weekend dining on all of the foodie favorites. Dine on Japanese tapas at the newly opened Trad Room, have a slice of some of the best artisanal pizza you'll find in Brooklyn at Saraghina, and enjoy brunch and Mediterranean cuisine at the local favorite Hart's. Community Gardens: If you like community gardening, the neighborhood has a wealth of gardens that have transformed empty lots into flower and vegetable gardens. Some of these projects date back over 20 years. Stores: Retail shopping is generally centralized along a few main arteries, though small bodegas, food stores, laundromats and so on are spotted throughout the mostly residential streets. So, you might need to walk a half mile to the nearest hardware store.